By 2030, there is a projected £6 billion annual demand for steel products in the UK [EEF]. This is the reason why most of the stakeholders in the industry opt for an automated system to keep up with the growth. Although the automation software is integrated to ruggedised computing systems, there is a need to further optimise and streamline its steel processes. Fortunately, one of the most ideal solutions to level up its automation system is to utilise reliable panel PC peripherals such as keyboards. The 72-key illuminated rugged industrial keyboard with trackerball is amongst the recommended devices by industrial computer experts. This type of product has the capability to provide accurate data input and easy software navigation. This also results in a more dynamic workflow as it improves workflow efficiency. So, what are the key features and capabilities of this device that can be useful for steel manufacturing? Keep reading this blog. And, understand how such kind of industrial keyboards can provide better functionalities and support steel operations. A steel production will always bear an extreme working condition. As a matter of fact, existing elements that may cause damage to an industrial equipment is also possible. So, to ensure efficiency and functionality of a panel PC, it is crucial to also equip it with reliable peripherals. Now, having installed a ruggedised keyboard with 72-keys and trackerball on panel PCs can be used to further augment a steel making process. With its innumerable features, it can provide a more accurate data input and easy navigation for multifaceted operations. In the succeeding section, let us highlight some of its features that are highly-applicable for an optimised steel production. 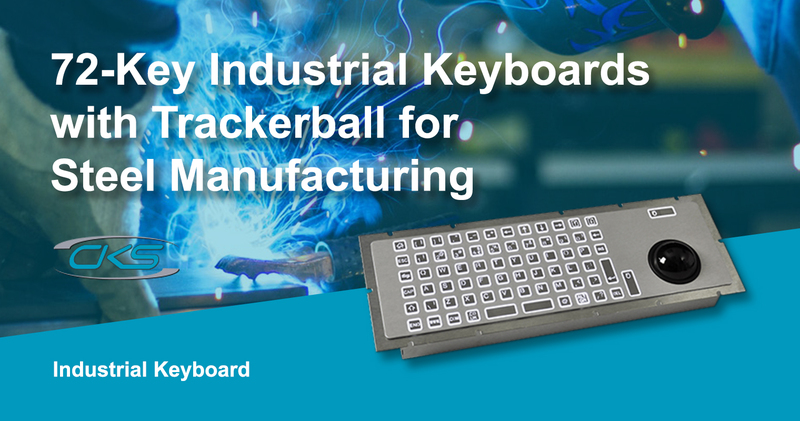 More than being a robust peripheral, this 72-key illuminated ruggedised keyboard with trackerball have several specifications that can be suitable for enhancing steel-making processes. In steel manufacturing operations, efficiency is crucial for operators. But, having installed a 72-key industrial keyboard with trackerball on panel PCs can save up the workspace. For instance, trackerballs can be operated with only the fingers. As a result, steel operators can have a more dynamic navigation and data input which results in faster processing time. Some areas in steel-making facilities may have tough ambient situations. So, a LED-illuminated 72-key rugged keyboard is an excellent choice to install in these areas. It allows for better readability whilst ensuring that data is correctly coded in the system. Thus, it prevents miscalculations that may result to backlogging of processes. Industrial setting requires durable and reliable hardware due to its harsh conditions. But, this type of PC peripheral has a mechanical switch technology which is very durable. These mechanical keys can last under extreme usage and provides a more accurate response. Hence, miscalculations that will result in backlogged tasks can be prevented. Remarkably, automation is already existent in all steel-making operations. In effect, industrial applications became more organised and managed efficiently. But, along with its advancement also requires a robust computing system with industrial-grade components. By embedding rugged keyboards with 72-key and trackball on industrial PCs, it can allow operators to have a precise data input and easy software navigation. So, it is an ergonomic solution for streamlining information flow with minimal downtime. Look for a reliable industrial PC manufacturer today and start upgrading your steel processes with the right computing technology.